MTV and SciFi Channel veteran, Voltaire, takes a dark look at gift-giving and the negative effect it has on the Earth in this two-minute Christmas parable. Synopsis: Director Voltaire and My Chemical Romance front man, Gerard Way make a Creepy Christmas film for Glass Eye Pix. MTV and SciFi Channel station I.D. veteran, Voltaire, known for his twisted, stop-motion animation, has made a spooky holiday short. 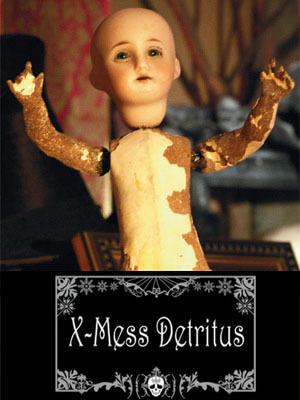 Voltaire's film, X-mess Detritus is a cautionary parable about the dangers of holiday gift-giving and the effect the resulting garbage has on the Earth. Voltaire wrote a poem to tell this tale and enlisted My Chemical Romance front man, Gerard Way to narrate his creepy Christmas short. Says Voltaire, "My other two shorts are narrated by singers (Rakthavira is narrated by Deborah Harry of Blondie and Transrexia is narrated by Richard Butler of the Psychedelic Furs) so I wanted to keep that tradition. Plus I had been wanting to collaborate with Gerard on something for a while now so when the chance popped up, I jumped for it. He's super talented and a true professional. He brought so much to the film and is just amazingly easy to be around."